﻿ Buddha Amitabha mantra and seed syllable in Siddham and Tibetan - including Amitayus mantra, the Shingon Amitabha Mantra, and the Nembutsu. Amitābha is the Buddha of the Western quarter. His name means "infinite light" - amita (unmeasured, boundless, infinite) + ābha (splendour, light; colour, appearance, beauty - related to bha : light, lustre, splendour; a name for the planet Venus.). He is usually depicted as a bhikṣu with his hands in the dhyana mudra. He is deep red in colour. Another form common in the Western Buddhist Order shows him with his right hand holding up a full red lotus, while his left hand remains in his lap. Amitābha dwells in his pureland called Sukhāvatī - the happy realm.which is described in the Sukhāvatīvyūha sūtras (large and small). Amitābha is closely related to Amitāyus - infinite life - who is sometimes described as his "reflex". A mantra for Amitāyus is included below. A visualisation meditation on Amitāyus is described in the Amitāyurdhyāna Sūtra. These Three sūtras are collectively described as the "Pureland Scriptures" and belong to the earliest strata of Mahāyāna texts. Amitābha's special quality is Compassion, which is balanced in the Mandala of the Jinas by Akṣobhya the Buddha of Wisdom. Amitābha is the head of the Padma, or Lotus family. I've cited the mantra in Siddhaṃ using the correct Sanskrit spelling, but the others using the common Tibetan spelling. Below are two other mantras used in two different Japanese traditions. The word amideva which is used in Tibetan traditions is not as it would seem ‘undying god’, but is due to a Tibetan mispronunciation of Amitābha’s name. Compare the Tibetan transliteration of vajra as badzra. This was pointed out to me by David Leskowitz in an email and is also mentioned by Sangharakshita (1981) Concluding Remarks. Preordination Course 1981 [Tuscany 29.11.81], p.111. I have also seen Tibetan explanations which say that Dewa (the tibetan spelling) is short for Dewachen the name of Sukhāvatī in Tibetan. 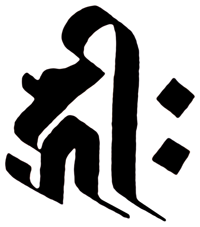 Dewa is the Tibetan word for sukha. So it could be that this mantra is a Sanskrit/Tibetan hybrid. However this explanation could be due to transliteration difficulties with Tibetan. The word is more precisely transliterated as "bde ba" (pronounced dewa) and the similarity of pronunciation may just be a coincidence. The Shingon school uses a rather different mantra for Amitābha or as they call him Amida Nyorai. Nyorai is the Japanese word for Tathāgata. Amṛta means deathless; tejehara is possibly a compound of tejas - sharp, bright, brilliant; and hara - bringing, bearing, wearing etc: so tejehara is probably something like the bearing brilliance. (Note that this would be very similar in meaning to the name Lucifer in Latin, the name of the Morning Star and later erroneously associated with the Christian Devil). Interestingly in Shingon they still use hrīḥ as his seed-syllable, despite having hūṃ in the mantra. Amitābha is the focus of the Pure Land schools of Buddhism which are very popular in Japan. Japanese Pure Land Buddhists will often be heard to chant the nembutsu: namu amida butsu (Japanese:南 無 阿 弥 陀 仏 ; Sanskrit: namo 'mitābhāya buddhāya). We can easily use Siddhaṃ to write Japanese - a fact which may have led to the development of the Japanese kana scripts after the study of Siddham was introduced to japan by Kūkai in the 9th century. Note that the last Japanese character 仏 is read butsu - Japanese often uses two syllables to express one kanji. The Nembutsu literally means "homage to Amitābha Buddha", although it is common to see translations such as "I have faith in Amitābha" cited as "the literal meaning" of the words. Namo comes from the same root as the word namaste which means "homage to you" (namas + te). Amitāyus means "Infinite Life", or immortality. This mani stone in Sikkhim shows the Amitāyus mantra as the Tibetans write it in the Uchen script. The Tibetan has āmaraṇa which is a word – meaning 'till death' – but I think the context requires us to read this as a short 'a'. Amaraṇi probably comes from amaraṇa = not (a-) dying (maraṇa) – i.e. immortality. The verbal root is √mṛ 'to die'. The '-i' ending is a puzzle because amaraṇa is a neuter action noun. The usual feminine of the kind of noun would be amaraṇī, but this form is not in my dictionary so, if this was the intended form I don't understand what it might mean, or why it is feminine. This kind of garbling is expected in Tibetan mantras. The Tibetan has dzi for Sanskrit jī. The word on the maṇistone is jīvanteye, often given by Tibetans as jīvantiye, though both of these forms are incorrect. Jīva means 'living, existing'; and jīvanta is a present participle, "living". It's used as a standalone word in Sanskrit to mean "life, long lived". The suffix -ye is a faux dative case ending often found in mantras (the proper dative is jīvantāye). The extent to which one corrects such things is moot, since most Buddhists reject any revisions to mantras, even when the garbling is obvious. Jīvantaye means 'to the one who lives long' – ie 'to him who lives' [forever]. We can see jīvanta as a synonym for amaraṇa. We could read amaraṇi-jīvantaye as 'to the undying immortal'. My suspicion, not confirmed, is that the phrase is amaraṇajīvantaye - changing the 'i' to 'a' for amaraṇa making it the undeclined form, and making the whole thing one long dvandva compound. I'll keep looking for a Sanskrit source, but have only found Tibetan to date. Amitābha is known as Amida in Japanese Pureland (Shin) Buddhism.